Share the Gift of Dance - Gift Certificates NOW Available! Hello fellow Dancers and Bloggers! Share the love of Dance with your family & friends! 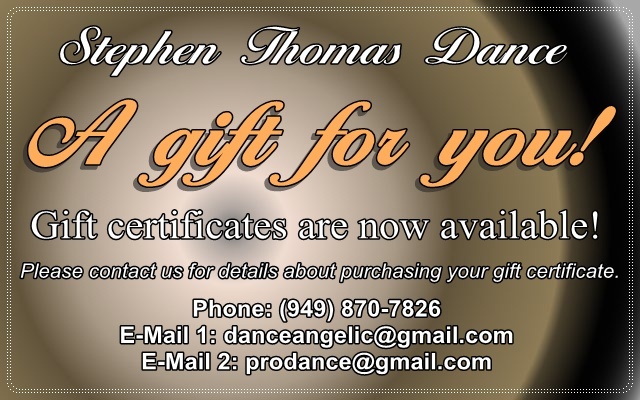 Gift certificates are now available at Stephen Thomas Dance. Great for Birthdays, Anniversaries, Weddings, Valentine's day or any other Special Occasion, Holiday or Event! Please contact us at (949) 870-7826 for a printable version of your Certificate along with the details of your purchase. If you are unable to print, let us know, and we can send you a Certificate in the mail (via: USPS ground). Please note that the postage will be added to your total purchase.